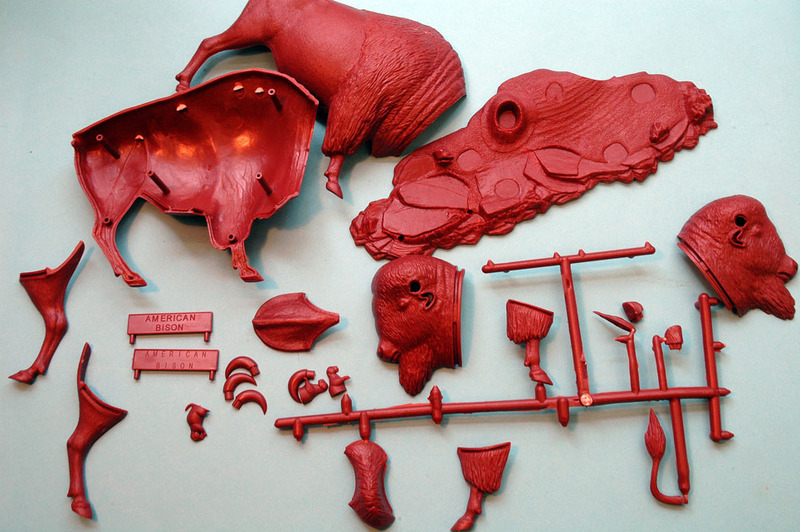 The original Aurora company excelled at figures, especially TV and movie stars, but the company also made a whole range of animal kits. Sadly, few of these exist today, as mould materials and tool frames were often reused to make new kits when Aurora was at its height, or in later years when Monogram took over the tooling, many were considered no longer viable, and destroyed. The original Aurora box-art, very different to the Atlantis version. Today, several new kit companies - collectively dubbed ‘The New Aurora’ - have come to the rescue. Surviving production tooling has been re-used, or where tooling has long gone, new versions have been made by retro- (or back-) engineering, in which new tooling is made by copying the parts of an original unbuilt kit. 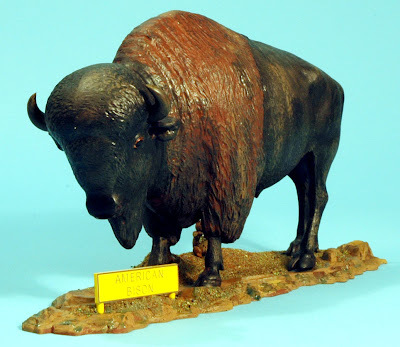 One of the newest companies specialising in reissuing or recreating old Aurora kits is Atlantis Models, and here we are looking at the company’s re-tool of what Aurora called the American Buffalo. 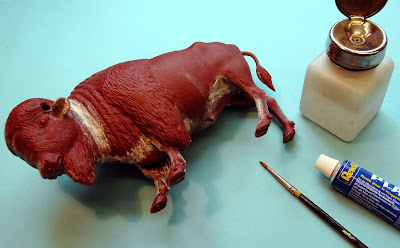 This was one of a set of six North American wildlife models, the other five being the Black Bear and Cubs (already made by Atlantis to a larger 1:10 scale), White Tailed Deer, Cougar, Big Horn Sheep (on the Atlantis upcoming kit list), and White Stallion. 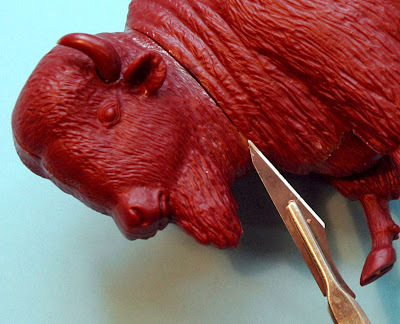 Modelling putty used to fill the seams. The Atlantis kit is almost identical to Aurora’s original (only the nameplate differs) and is made to the same 1:16 scale. 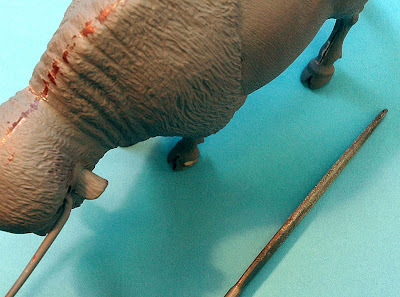 It’s something of an in-between scale, but even so the assembled animal - an adult male - is 127 mm (5 in) high. He stands on a piece of grassland terrain some 235 mm (9.25 in) long that is an exact replica of the Aurora original, even down to a pair of prairie dogs. Scalpel is useful to scrape components when needed. Needle file smooths off joins and filler. Construction is very straightforward, with just 24 components to assemble, including the base and two name plates, so - as with most of these types of kit - the time you put in is mostly down to the finish. Bison are usually dark-brown, almost black, throughout most of the coat, which varies winter and summer (the kit depicting the latter) though streaks of reddish-brown often appear. It’s a good opportunity to dig out those odd pots of browns, reds and greys, to use them up! You can also practise your dry-brushing, in which you wipe most of the paint off the brush, then lightly drag it over the surface, to leave just a hint of colour, a highly suitable technique for this subject. 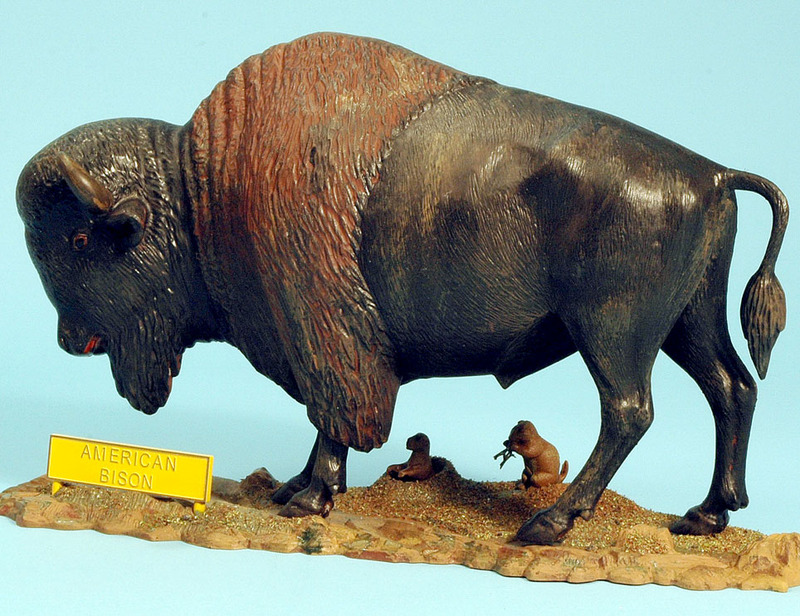 The finished bison is reasonably convincing, and the base includes a choice of nameplate. 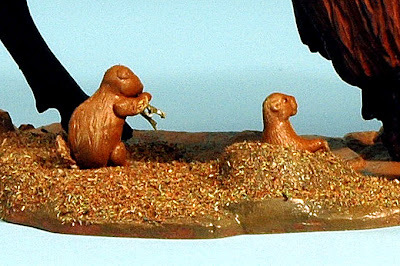 Two prairie dogs inhabit the ground beneath the bison’s feet. 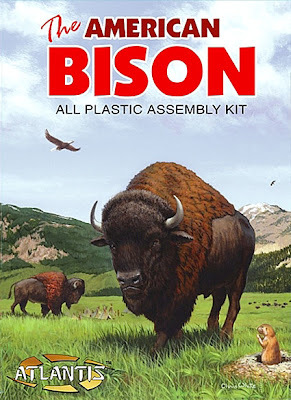 So should the kit be Aurora’s ‘Buffalo’ or the Atlantis ‘Bison’? Well, Atlantis has the name correct, though the colloquial ‘American Buffalo’ is often used to distinguish the species from others around the world. 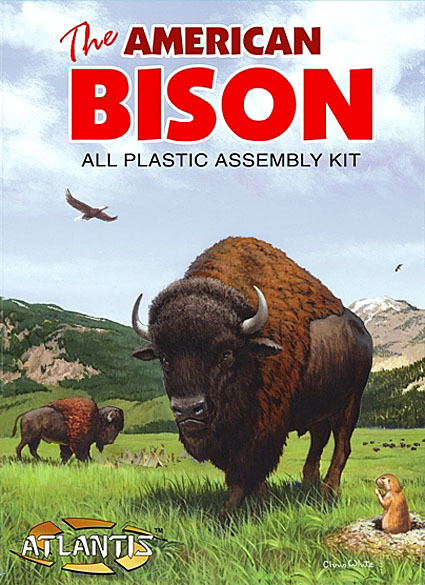 Bison kit supplied courtesy Atlantis Models. Visit the website here. 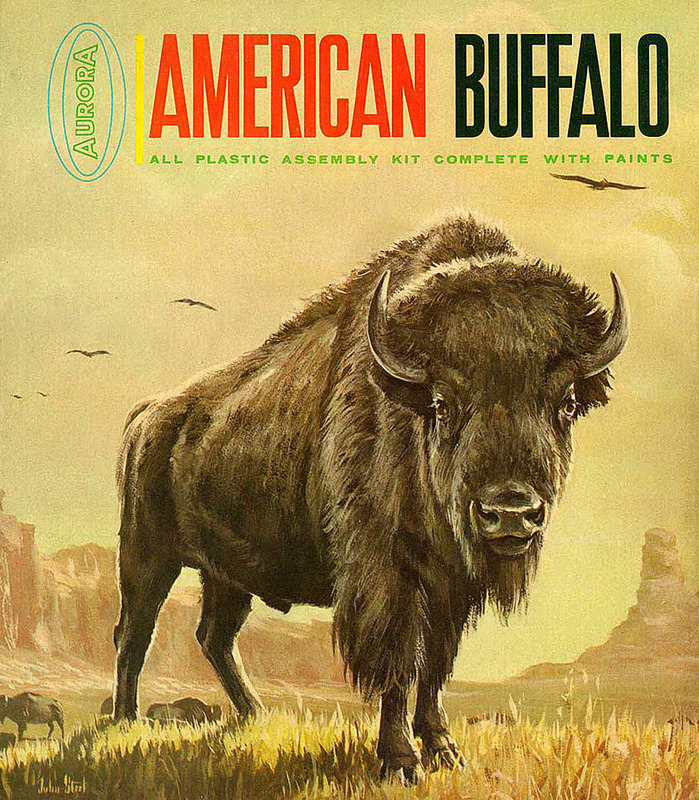 Aurora American Buffalo box image supplied courtesy Andy Yanchus.